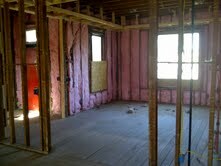 We finally passed all rough-in inspections and have now hung all the insulation. It took 2 tries with my hvac sub contractor, he forgot to strap down the furnace and didn’t run hard pipe gas line through the unit so we had to call for a second inspection after having him come fix the two issues. These are small details which he should have caught but nonetheless we got all the signatures now on our inspection card and the City inspector is starting to warm up to me a bit now that he sees we know what we are doing. 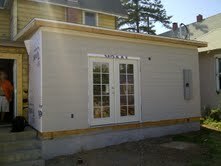 Right after passing I scheduled the insulation to be hung the next day and its called in for an inspection for tomorrow. 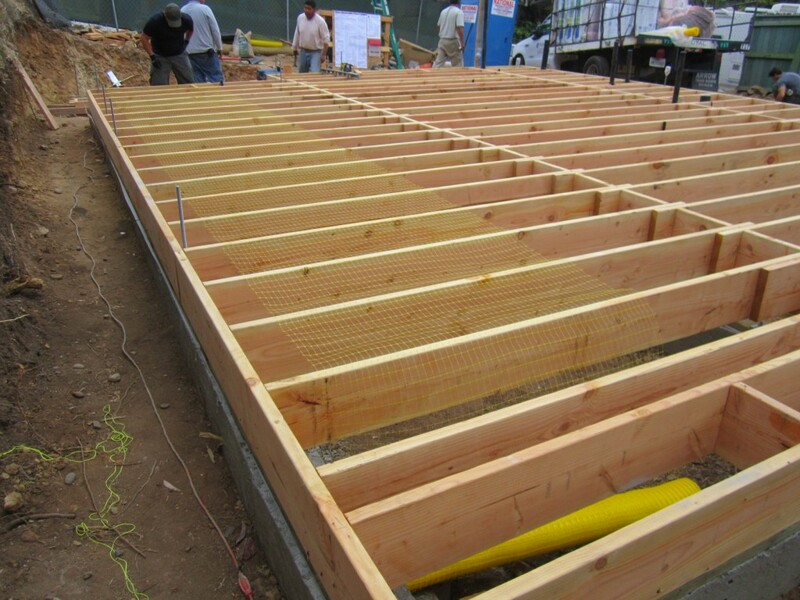 I insulated the exterior walls and complete sub floor. 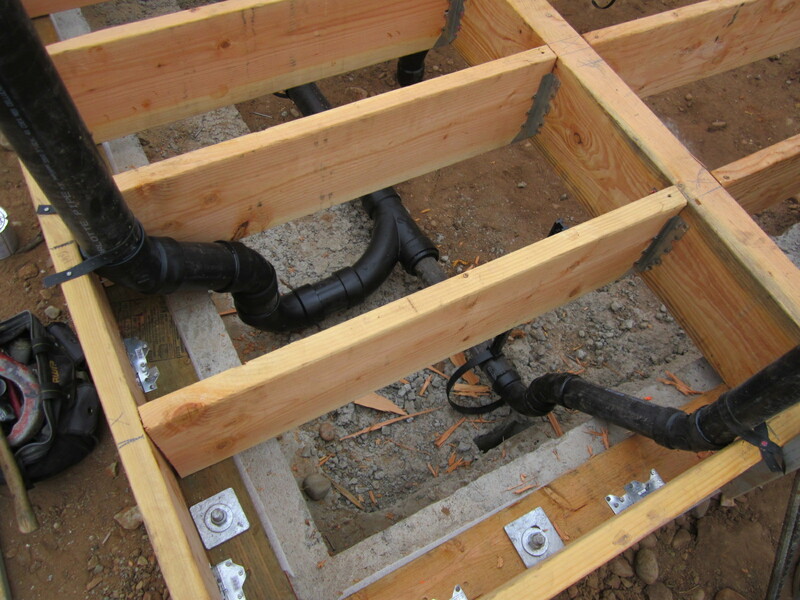 This is over and above what my permit called for but having all the walls opens provides such an obvious opportunity to save energy and provide someone with a product we can be proud of. I’m sure the new homeowner will unknowingly be thanking me every month when they pay their electric bill. With all the walls open I also ran Cat-6 and cable wires to all the bedrooms. We are in a heat wave right now in San Diego, I wouldn’t have wanted to be the guy under the house all day itching and scratching trying to hang this stuff. I jumped outside and started trimming out the exterior also, I re-framed the front porch and used 1×3 tongue and groove for the decking that’s historically correct. It’s a little more than I could have spent on another material but its details like this that will pay off in the end and especially since its on the front of the house which is always the most important to focus on. I also got some of my windows installed and I’m telling you they are so neat. TM Cobb makes a mighty fine wooden double hung window for historic homes. I’m totally happy and cant wait for the missing 2 to arrive with the Victorian front door so I can install them too. 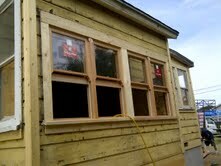 Here’s the bank of 4 windows on the study or optional 5th bedroom. This room is going to be killer with all the light that’s coming in. There was a lot of missing trim on the corners of the house that was probably removed when the metal siding went on. This stuff is easy to replace so we’ve been working our way around the house getting everything back to how it should be. 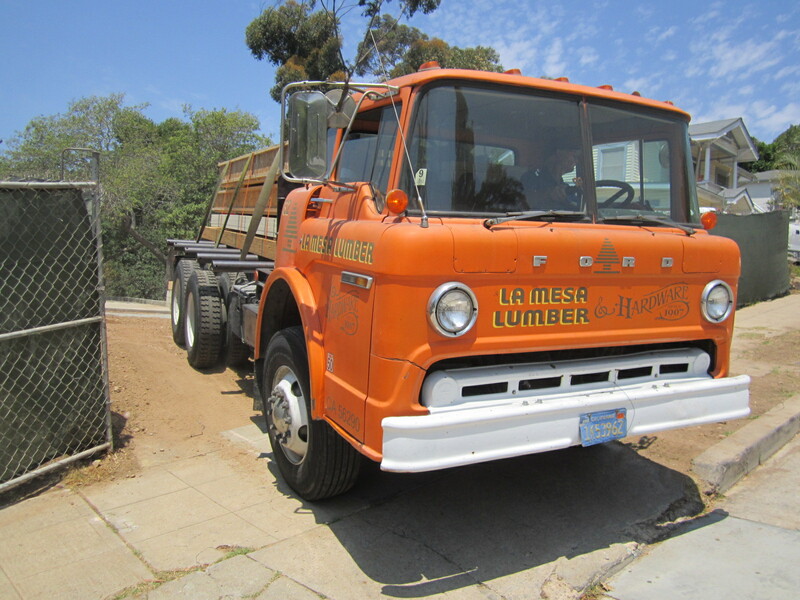 For the rear master suite room addition I purchased 10″ cedar beveled channel siding from La Mesa Lumber at $2.50/foot. This is the first time I’ve used it and boy is it nice. It comes pre-primed and its very straight, unlike the T117 siding I’ve frequently used on the Craftsman bungalows. 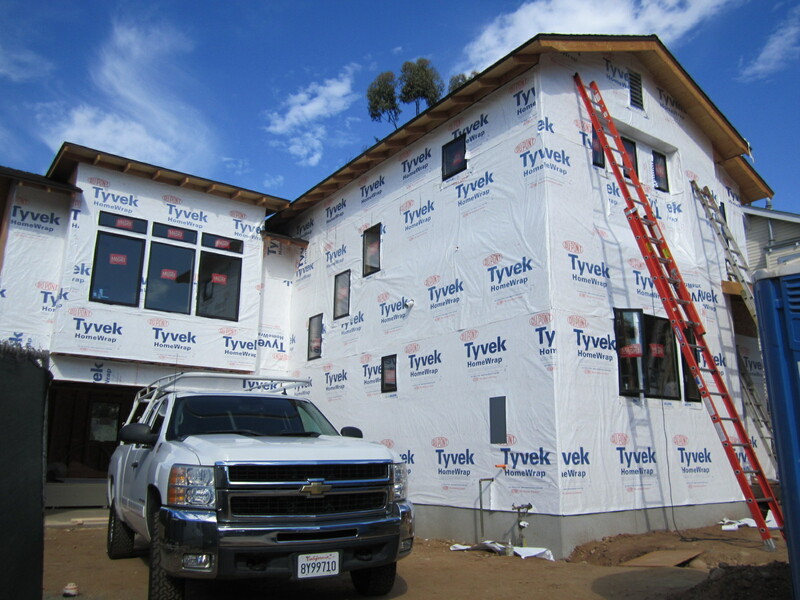 We wrapped the room addition with Tyvek first of course and are now putting the 773 siding up. It’s great to use all the correct materials, in this case its costing me about $1400.00 for this siding but its going to be worth it. The historical review board here in San Diego wouldn’t even have let me use Hardi Siding if I wanted to. My colors were also approved this week so once the exterior trim and siding is all complete I’m going to have 2 crews in simultaneously painting the exterior of the house and hanging the drywall on the inside. Once the drywall is hung we have to get a nailing inspection where they verify spacing on the screws before we tape and float over it. Stay tuned, we’re going to see some dramatic changes soon. Also, Get on over to Biggerpockets.com and check out the video interview I did with Josh. I break down our business model and explain what kind of projects we look for. I had my framing inspection Monday and he passed me on the room addition but failed the new front porch because I had trimmed it out already and he couldn’t see how it was framed…oops. He said he would pass it with a letter from an engineer so I had to pay 300 bucks to have my engineer crawl in the attic to verify my framing was done correctly and draw up a certificate on it. I went straight into hanging all the insulation and called in for the insulation inspection Tuesday. The same inspector showed up the following day and passed me on that. Meanwhile I had all the drywall delivered. 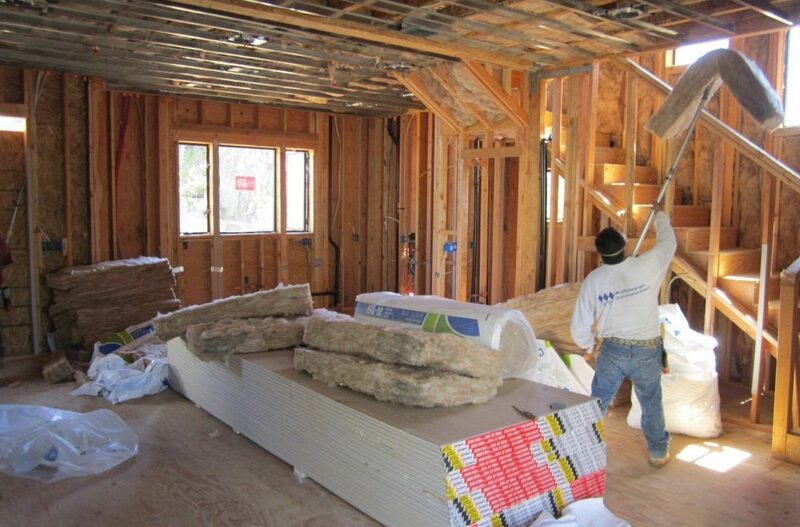 It turned out to be 150 sheets for the room addition, kitchen and existing bath. Man, prices on drywall have come down; I only paid 6.50 per sheet for 12 footers. 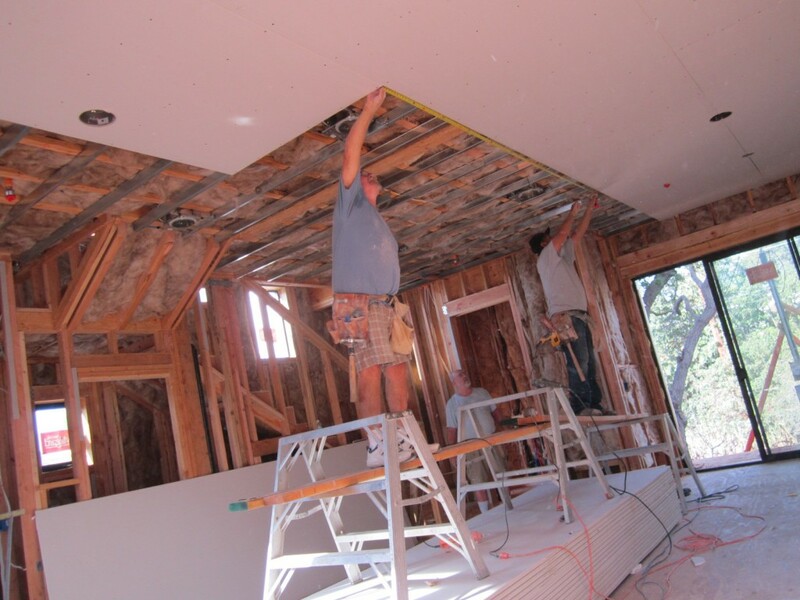 My drywall crew hung it in a day and went straight into tape and float over the weekend. It’s coming out really nice as it’s always a cool stage to get to when you can see it all sealed up and smelling new. My drywall crew charges 10 bucks/sheet to hang, tape and float and texture. Since the existing bedrooms were not demo’ed I am retexturing the whole house so it will match. These guys are real pro; they do mostly new construction so the seams come out great. For texturing they don’t mix in a hopper, a truck with a mixing machine actually shows up and they spray the whole house with one batch so it turns out consistent. Drywall finishes and textures can make it or break it when it comes down to your final product so it’s important to get pros to do this part. In the past I’ve done small rooms myself but now that we are on a larger level I always sub this out. I also got all the wood floor patching done which included all new wood in the kitchen and I also ran it into the addition. I even put the wood floors into the master bath, which will be new for me this time and should be a real dramatic touch. 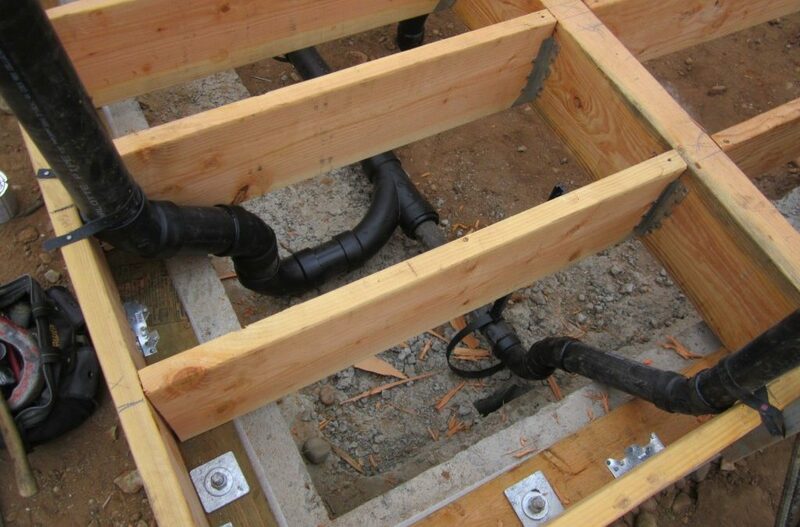 With all the rain lately (6 inches in 1 night) I feel lucky that at least I’m making progress inside the house. After being in a record drought all summer now we get hammered with flooding, crazy weather here in Texas. The local San Antonio real estate market continues to slow. So far this year we’ve had only 13,185 homes sold compared to the same period last year of 14,724 and 17,981 for 2007. Last year was the big slow down here when a lot of Realtors went starving. Things picked up a little this summer mainly due to the $8000 first time buyer tax credit so it will be interesting to see what happens to the real estate market if they let it expire. There’s a bill in Congress to raise the credit to $15,000 and open it to non-owner occupied buyers which would be great for investors and definitely clean up some inventory, but I’m not sure how we could pay for it. Foreclosures at the courthouse steps here in SA are also still rising, I ran across a Realtor friends’ house while reviewing the auction list for this month. Ouch, now that’s hitting close to home. Our strategy for this market is as always be extra careful on location, buy extremely right and offer a high quality renovation and unique product for the price level. Even with the slower market there are a lot of people continuing to move here to San Antonio and we only need one buyer. The skies cleared and the inspection gods have blessed our project. Finally, we passed all 3 rough-in inspections. We had to have the mechanical inspected twice and he almost failed me the second time because I had the incorrect tape on the joints of the dryer exhaust vent. The correct taping for the seams is the UL rated aluminum tape with the red letters, same as the A/C guys use. After some word games and a battle of the egos he busted out the green card much to my relief. It always seems the young inspectors have such a chip on their shoulders while the old guys just roll through, pass you and start talking sports and telling stories. 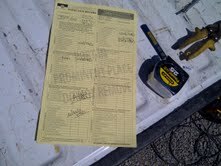 Since I pulled the main building permit myself as the owner/builder then I am in charge of the next 2 inspections. First I’ve called in for framing inspection Monday for which the City of San Antonio will look at the placement of the fixtures with relation to each other, framing and construction as well as fire blocking of all penetrations from wiring and plumbing and foaming of the windows. Once I pass this framing inspection Monday I’ll be free to hang the insulation and call in for insulation inspection for Tuesday. 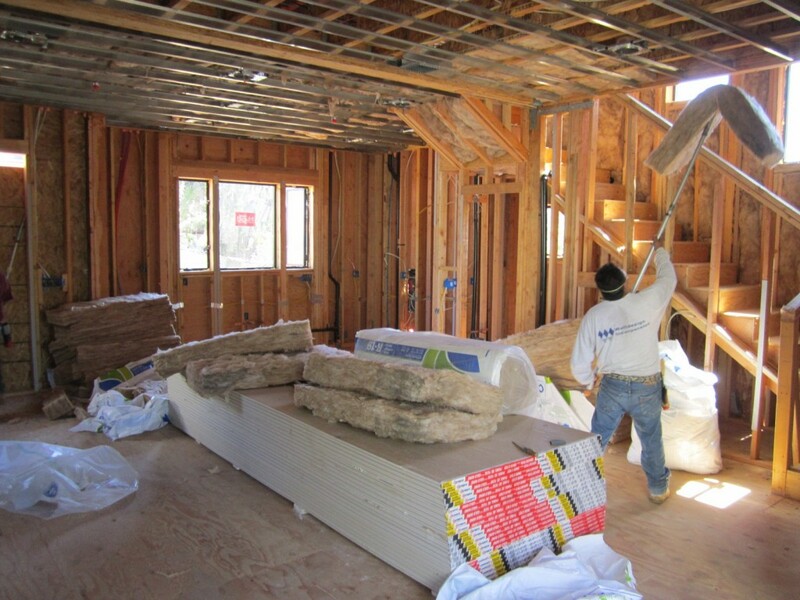 If you hire a company to insulate your new construction they will furnish you with a certificate that will satisfy the city but because I am such a penny pincher I hang it myself which thereby requires them to come inspect. 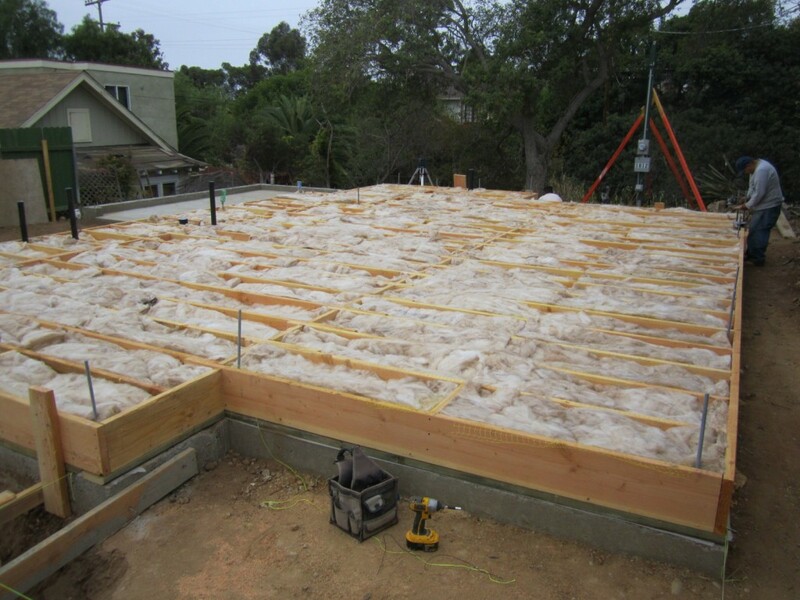 I buy the insulation wholesale saving about 30% from what Home Depot or Lowe’s charge. Once I pass insulation inspection I am finally free to drywall! Yea buddy, whew! You’ll also see on the video update that I’ve trimmed out the front porch and removed all the kitchen hardwoods due to old water damage and poor patching. I need to get the new wood patched in also before drywalling the kitchen but that won’t take long. The original wood floors in my house are red oak, which is still available through lumber liquidators for .45/ foot. 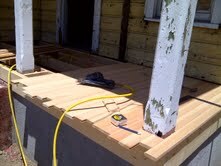 All 330 feet of wood I am replacing only cost me about 700 bucks. Once the floors are refinished you wont see the patches. I am planning on the dark walnut stain again since they seem to be so trendy now. Stay tuned; next time you see the house it will be all sealed up. It’s a big milestone, what was previously stick framing all of a sudden becomes recognizable defined spaces.